Volunteering is one of the most enriching things that you can bring into your life. I say that with a hand on my heart! I have witnessed first-hand the profoundly positive impacts volunteering can have on people, from working alongside over 500 volunteers who give their time to St Clare Hospice. 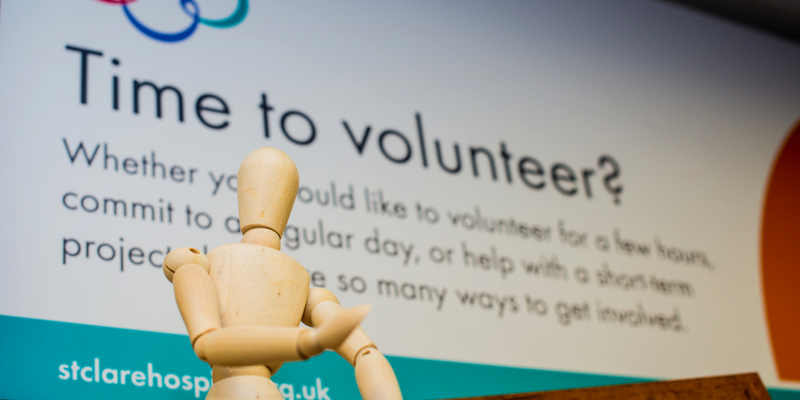 So often volunteering is seen as something that only certain types of people can do – those who have more free time than others, or who have a personal connection to a charity, or those who are simply perceived as ‘do-gooders’! The truth is that volunteering can be for anyone and everyone! The main thing about volunteering that I think people need to understand is that it is supposed to fit in around your life and what you already do; it shouldn’t be a burden or a chore! Most of all, volunteering should be just as beneficial to you, as it is to your chosen charity or cause. Volunteering should feel like you are making a difference, whilst adding purpose and meaning to your life in the areas you wish to fulfil. It can teach us skills, help us to improve ourselves, make us happier, and keep us fitter both mentally and physically. If volunteering is a way to meet new and interesting people, that’s great! Perhaps it helps you to make changes in your community and make the world a better place – that’s great! If it helps you to advance your career with valuable work experience, that’s great! Volunteering is as individual as the person who is giving their time. It means something different to us all. From combatting litter in our oceans worldwide, to helping your neighbour cut their grass – or volunteering with your local hospice charity (that’s us!) – volunteering offers something for everyone. When you embark upon a volunteering role that suits you and the things you like, it connects you to other people who have similar interests to you. It’s a great way to meet new people, strengthening your tie to the community and broadening your support network. Additionally, making an impact in your local community, together, and helping the world to be a better place, can be extremely fulfilling. But it’s a two way street; during your volunteering you will likely have an impact on the lives of people, animals and organisations in need. You’re helping others, and enriching your own life at the same time. By measuring hormones and brain activity, researchers have discovered that being helpful to others delivers pleasure and happiness. As human beings, we are hard-wired to give to others. Being social and enjoying feelings of togetherness is in our very nature! The more we give, the happier we feel. Giving your time to a cause you care about is also a really great way to explore your interests and passions. It’s supposed to be fun! Volunteering can be an escape from the usual mundanities of everyday life – it can be both relaxing and energising, giving you time to recharge and do something you enjoy. It is a hobby you can commit to, that also benefits your chosen cause. Whilst some people are naturally outgoing, some of us are a little more shy and don’t find it so easy to meet new people. Volunteering has got you covered! Mixing with new people on a regular basis can help to develop your social skills which will serve you all throughout your life. That alone will build your confidence as an individual. However, it’s also fair to say that helping others gives you a natural sense of accomplishment as well. Volunteering can give offer you a sense of pride and identity, helping you to feel better about yourself and to adopt a more positive outlook on your life and future goals. Being around others and feeling like you are helping people can have a profound effect on your psychological well-being. Volunteering keeps you in contact with others on a regular basis, and helps you to develop meaningful relationships and a solid support system that can combat negative feelings – including depression. Helping others is also deeply rewarding which can give purpose to your life and make you feel good! Taking part in therapeutic activities such as gardening or working with animals can be incredibly cathartic, as well. It keeps the mind active and fulfils you with a sense of nurturing and care. Getting up and about, volunteering in your local community, can help you to stay active – both in mind and body. Studies have shown that those who volunteer actually have a lower mortality rate than those who do not. For older people, volunteering can encourage us to walk more and find it easier to do everyday tasks. This can mean having a lower blood pressure and improved thinking skills. Volunteering can also lessen symptoms of chronic pain and reduce the risk of heart disease. Staying fit and healthy is a benefit in all aspects of our lives. It helps us to feel more ready to take on the day and live how we want to live! Volunteering is all about giving your time to a worthy cause, helping to make the world a better place. Knowing that you have been a part of improving someone’s life, helping the environment, or making a difference to whatever it is you really care about, can give you a sense of purpose and meaning in your life. Volunteering really does change the world. Being a part of it can also help you to find direction in your own journey. Volunteering offers you a fantastic opportunity to learn new skills. Don’t be fooled into thinking that because it’s unpaid, the skills you learn are basic! Many opportunities provide extensive training, and the experience you gain is absolutely invaluable. Learning new skills, or building upon the ones you already have, can open up a whole new host of opportunities for you – whilst helping you to further your career! Volunteering can also offer you the opportunity to try out new career paths without making a long-term commitment. It’s a great way to dip your toe in the water! Filling your free time with new experiences can be extremely enriching. By being a proactive member of the community, you will likely see and do things that you may not have encountered otherwise. You will experience the world in a different way, crossing paths with people from different walks of life and learning all about your chosen cause. Seeing more of the world and experiencing new things can help you to feel inspired and motivated. It can renew your creativity to the benefit of your personal and professional life. In short, you will feel more ‘cultured’ and aware of the world around you. You will feel empowered to take on future experiences with an open mind and heart. Lastly, yet probably one of the most important things about volunteering, is that it really does make a huge difference. Volunteering changes lives. The 500 volunteers here at St Clare give 100,000 hours to us in donated time over the course of a year. To put it simply, we literally couldn’t do what we do without them. Our volunteers tend our gardens, support bereaved families, offer personal care to our patients, assist in Day Therapy groups, help run our shops, keep our offices running smoothly, fundraise for us… the list is endless. Their support means that we can continue to offer and develop our specialist, palliative care services to people and families who need us in the local community. In a bigger picture, volunteers contribute the equivalent of billions of pounds in their volunteering efforts to the global economy. Their generosity in giving their time is absolutely vital to ensuring important causes across the globe can deliver their crucial services. Rob Wallace is the Voluntary Services Manager at St Clare, managing a team of over 500 volunteers who give their time to the hospice 365 days a year. This blog was created in celebration of Volunteers’ Week 2018, 1 – 7 June.